Chris Nettekoven - wakhanexpedition2012s Jimdo-Page! Chris Nettekoven - (expedition film maker/mountaineer, Germany). Experienced traveller through the Asian continent; Iran, Pakistan, China, Tibet, Nepal, India, Bhutan, Burma, Laos, Cambodia, Vietnam, Thailand, Malaysia, Indonesia as well as North and South America and northern Africa. He blames the time spent in Rocky Mountains at an early age as the root of his passion for mountains which eventually lead him to climb all over the world. From the Alps via Altlas Range of Morocco to the Andes, Iranian Alborz Range and further into Karakorum and Himalaya, climbing KOH-E-BROBAR / Mt.Equality - (first ascent), Pakistan/Karakorum; Huayna Potosi - 6.088m, Licancabur - 5.916m, Uturuncu 6.020m - retreated at 5.700m, Chacaltaya – 5.395m (Bolivia, Andes); Mt. Damavand - 5.670m (Iran/Alborz Range). His expedition clips have been shown on Japanese FUJI TV and Japanese TV ASAHI. 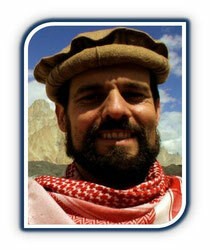 Chris’s recent clips for Pakistan Youth Outreach «Gender Equality Karakorum Exped. 2011» can be seen on AFGHANISTAN`S SECRET PEAKS 2012 on Youtube . If Chris doesnt run around the mountain ranges he writes articles from the past tours for alpine and travel magazines and holds multivision presentations with photo&film for sports- und cultural clubs. Recently at the BERGSICHTEN Mountain&Outdoor Filmfestival in Dresden in front of an audience of nearly 900 people.